« Port of Manaus, Brazil – Why Would Anyone Want to Go There? Catching Alligators by the Light of an Amazon Moon! Spending time in the Amazon is one thing, but hunting caimans at night on the Amazon River is just spectacular. I am writing this as I glide through the Amazon night; above me is an inky sky filled with the dim outlines of storm clouds; below me is the dark and mysterious waters of a river as old as time. I am one of 10 people onboard a wooden canoe. We are gliding because the canoe is being powered by a small outboard motor. On the prow of the boat stands our guide, in his underwear. He has stripped down in anticipation of leaping off the boat into the river at a moment’s notice. Why? Because we are hunting caiman, that’s South American alligators by night. And he plans to catch one with his bare hands. In the night, the creatures are easier to spot because their eyes give off a ruby glint when a seachlight passes over them. I watch as the powerful lamp in my guide’s hand arcs to and fro in search of our quarry. I smile. The experience is enchanting, and I have given myself over to it entirely. I entertain the temptation of putting my fingers into the murky brown waters beneath our boat. I hesitate because I know of the nasty piranhas that populate these waters, and then there is the unknown. But my desire overcomes my caution, and I trail my fingers through the water. I gasp. The water of the Rio Solimoes (one of the rivers that make up the Amazon) is as warm as cool bathwater. I smile like a child on Christmas morning. And I dip my fingers again. I tilt my nose and inhale deeply; the night air in this rainforest paradise smells so alive, so full of promise — earthy, green, growing, teeming with life and its rebirth. 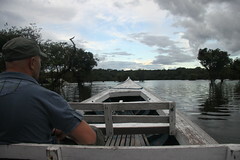 Do what you must to spend at least one day on the great Amazon River. Even if you don’t wind up catching caimans by the light of the moon, you will never forget this rich experience. This entry was posted on Saturday, January 31st, 2009 at 8:42 pm and is filed under Adventure Travel, Brazil, Family Vacations, South America, Variety. You can follow any responses to this entry through the RSS 2.0 feed. Both comments and pings are currently closed.